many of the international stories we’ve covered on the Alliance website reporting on the devastation and terror these extremist groups are causing. Even this week, as this idea magazine reaches you, we've heard of more attacks. It can seem like a desperate situation, so how should Christians react? The number of people identifying themselves as Muslim in the UK has grown by almost 70 per cent in 10 years, from 1.6 million in 2001 to 2.7 million in 2011. Experts estimate this will increase further to 5.5 million by 2020. One member organisation of the Alliance sees the spread of Islam as an opportunity to bring the gospel to a new group of people searching for the truth. The Mahabba Network is passionate about motivating and mobilising everyday Christians to love their Muslim neighbours. They’re helping churches to mentor and multiply new communities of Muslim converts. It seems like we are in a key period for the Islamic faith, but that God is doing something amazing in the midst of it all. This is a subject that many of our readers will feel strongly about. We welcome your comments and questions on the issues that arise while discussing the Islamic faith and our response. You can read all about them in this edition of idea. We share the incredible work the Mahabba Network is doing in the UK on pages 26 and 27. David Garrison, author of A Wind in the House of Islam, writes on what he’s calling the “greatest turning in history”, seeing unprecedented numbers of Muslims coming to faith in Jesus Christ. Turn to page 30 for more. Our new feature, Around the World Evangelical Alliance, brings you more stories of our evangelical family across the globe, so we can continue to pray and encourage their work. Turn to page 10 for that. We also speak to the new secretary general of the WEA, Bishop Ef. Read his views on the threats and challenges to the worldwide Church on page 18. Page 34 holds our brand new culture page, edited by threads, the Alliance's collective of those in their 20s and 30s. In this issue, one of their writers gives us his top 10 apps for Christians. P.s this edition of idea goes far beyond the magazine. 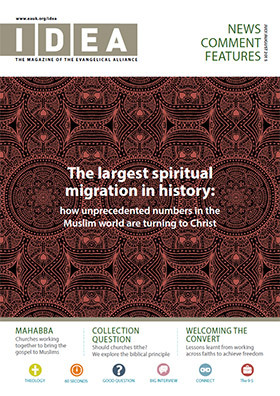 Visit eauk.org/idea to see videos and full-length interviews, or go to Twitter and tell us your views. Send your tweet to@idea_mag and join the conversation.